Aurora Borealis dances the night away. 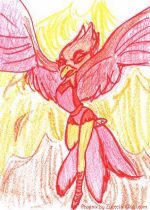 Aside from mud wrestling, hockey, kick boxing, dancing is Aurora's favorite activity. Aurora is copyright me. Aurora and Jinx cuddle. AWW! 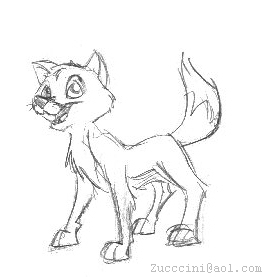 though this is an OLD sketch, it reminded me of today. It was my birthday, and everybody gave me hugs! I also got a rose...and my house teepeed. Whilst I was on vacation, my precious chinchilla died. I'll miss the little feller. This is a pose taken from one of Dan Haskett's drawings. 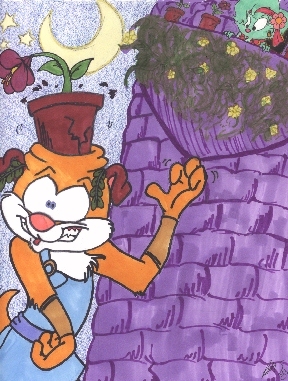 He does concept art for TTA, Animaniacs, and P&TB. I liked the pose and it works really well with Aurora, dontcha think? Aurora is © me. Been a while since I uploaded an Aurora pic. Anyways, I'm experimenting with backgrounds. The original drawing was beautiful, so I don't know WHAT happened. She's © lil' ol' me. "We've been WHAT?!?!" 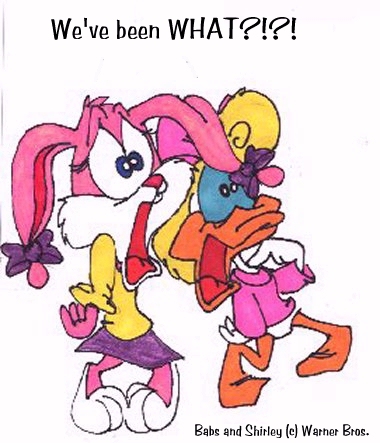 Babs Bunny and Shirley McLoon's reactions to Tiny Toon Adventures getting the ax. 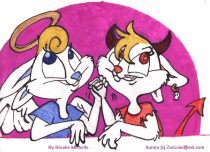 Babs Bunny and Shirley the Loon © Warner Bros.
Bandit and Zuccini: portrait of friendship. Okay, funny story. One of my oddimals is based on an actual person. Well, a friend of mine named Betsy was jealous that she didn't "have" an oddimal. She said she wanted to be Jinx. 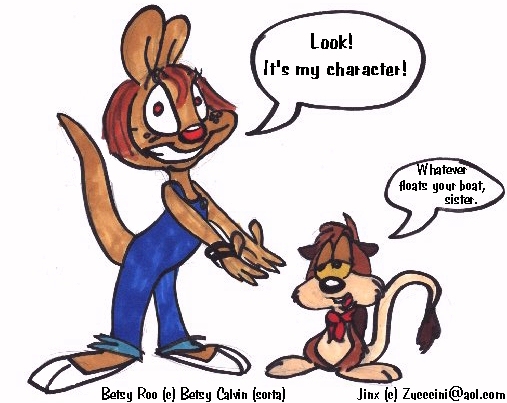 I said she was crazy and that she already had a character, a kangaroo named Betsy Roo. This pic makes fun of her and "her" character Jinx, whom is © me. Well! I got quite a respnse to my bmstyle1 posting! *Hugs* to you all! It was a half/half situation. Some liked the new style, some prefferred the old style, and a few liked 'em both. So, I'll post "new styled" stuff on this "bmstyle" name. Thanks! Oh, this is a dog or wolf of some sort. Hey! Medievel clothes were manly and commanding. They said everything, and they demanded respect. They also made one thing clear: these guys were panzies! Boomer © ye Brooke Michelle. Heyo! I'm back (yeah right). 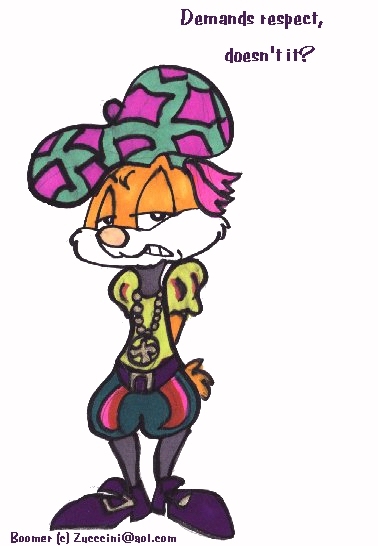 My sweet and wonderful friend Adam colored my character Bandit with photoshop! Yay! This pic is going up on ODDIMALS.COM. I love you, Adam! 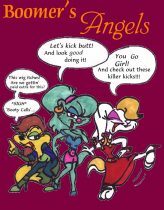 Go to his site at http://members.aol.com/comikozie/ Bandit © yours truly. Zuccini is using Boomer for a car, I guess. Vroom vroom! 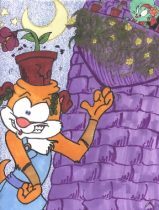 This was actually part of a larger collage I had of "oddimal love". Sorry for the small pic size. Thanks, Adam! Both are © me. Hidy-hi! It's Jinx this time, also colored by Adam. Tra la la. Oh, he's just looking pitiful as usual. Pitiful bat/rat thing is © me. Now it's Olivia. I like the way the colors look. I made her in that dreamy looking mood. I dunno why. I'm in need of sleep. Olivia is © me. Thanks, Adam! I always wondered what Cerberus, dog of Hell, would look like. 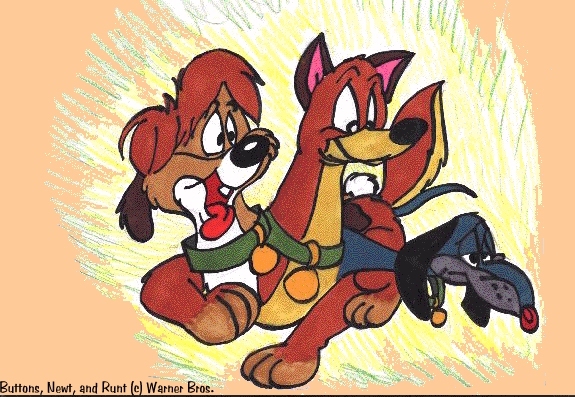 Probably nothing like this, but if Animaniacs ruled the underworld, he may look something like this... Runt, Buttons, and Newt © Warner Bros. 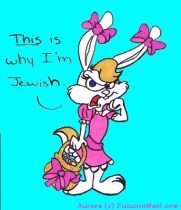 This is a pic of my only Jewish character, Aurora, partaking in a Christian holiday: Easter. This is actually a little poke at how Easter has been commercialized throughout history, with the Easter bunny and all. A little late, I know, but Happy Easter/ Passover! Aurora © me. This is a sketchy picture, I know, but it will be redone. 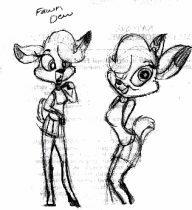 This is my newest character, Fawn Dew. 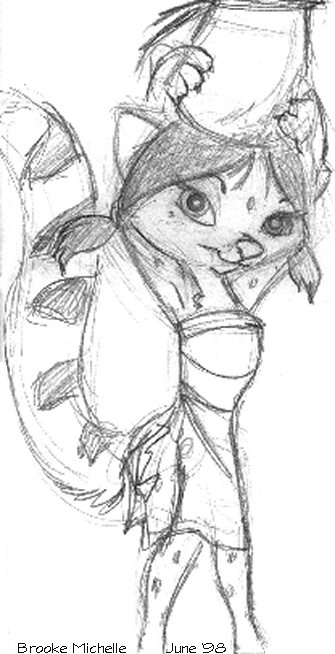 She aint an oddimal, but she's Lilla's friend. I guess. Anyhoo, she's a darling little deer, and she's not naked! Yay!!! 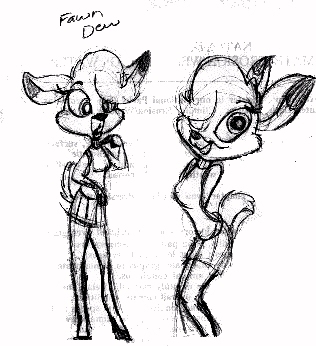 Fawn Dew © me! Fawn Dew in a striking pose. Doesn't she look lovely? I love her hair and her exagerrated deer legs, don't you? Rowwwr! Fawn Dew is © moi!!! 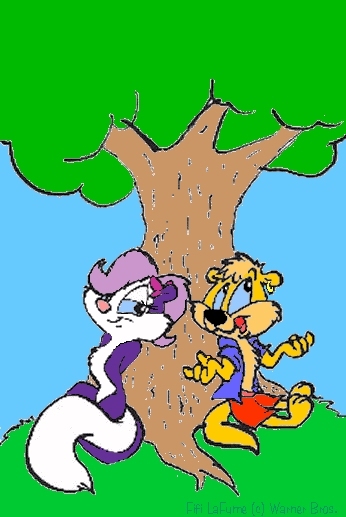 Fifi LaFume is sitting under an oak while her pen pal, Oliver "Ollie" Otter talks about life. This is taken from a scene in a fanfiction of Tiny Toons entitled "Sincerely Yours, Oliver". 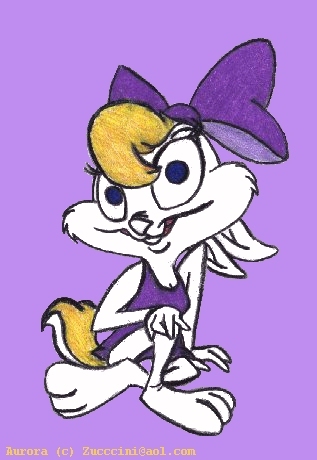 Fifi LaFume © Warner Bros. Ollie is my creation. I have been wanting to draw a phoenix for some time, and so I give you the fire bird morph Phoenix. 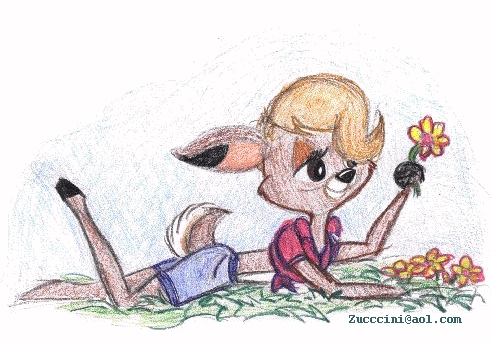 The pretty little deer Fawn lays in the grass in spring outdoors clothing picking a flower. I like this, with the light background a pastel colors. Fawn © me. Welcome to Spring! Me is back from "wonderful" trip. 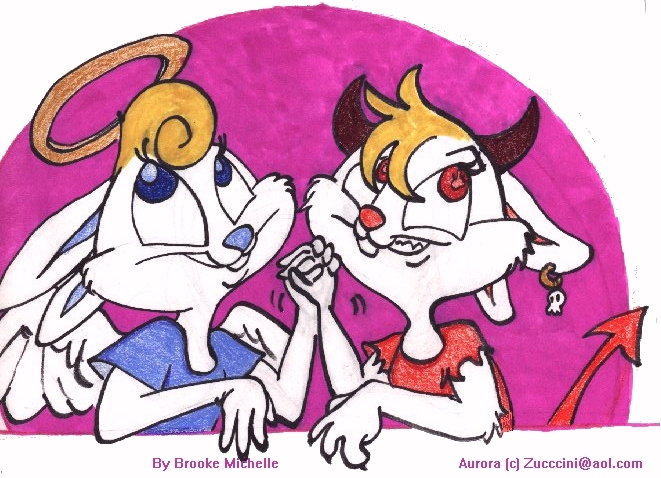 So, here is a pic of Aurora in "The neverending battle between good and evil". It's gonna be put on a t-shirt for sale. If anybody would actually buy tees with my characters, e-mail me. 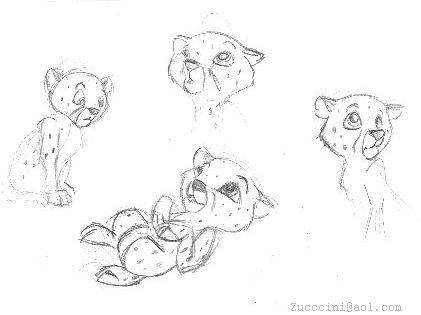 Something I sketched on the plane. It's an Indian civet (not Native American, India Indian) holding up a crudely drawn pot. Turbulence.